From the Kentucky Derby to the Dubai World Cup, the biggest horse racing events around the world pull out all the stops to create opulent, unforgettable experiences for their spectators. For the past nine years, the Deighton Cup in Vancouver has certainly earned its name as the ‘most stylish event of the summer.’ Women don their fascinators, men deck themselves out in their seersucker suits and they spend an exquisite day at the Hastings Racecourse. The team behind this fête is Tyson Villeneuve and Jordan Kallman of The Social Concierge (their creative and event agency is also responsible for fantastical events like the Vancouver edition of Dîner en Blanc) and co-owner Dax Droski who produces a range of unique corporate events in and out of the city including the Vancouver and Kelowna Hopscotch Festivals. If you’re attending the Cup, or if you’re interested in the illustrious horse racing tradition, we’ve put together a few pointers for how to do ace a day at the races. The Deighton Cup takes place at the Hastings Racecourse on July 22, 2017 in Vancouver, BC. To purchase tickets for the event, visit deightoncup.com. 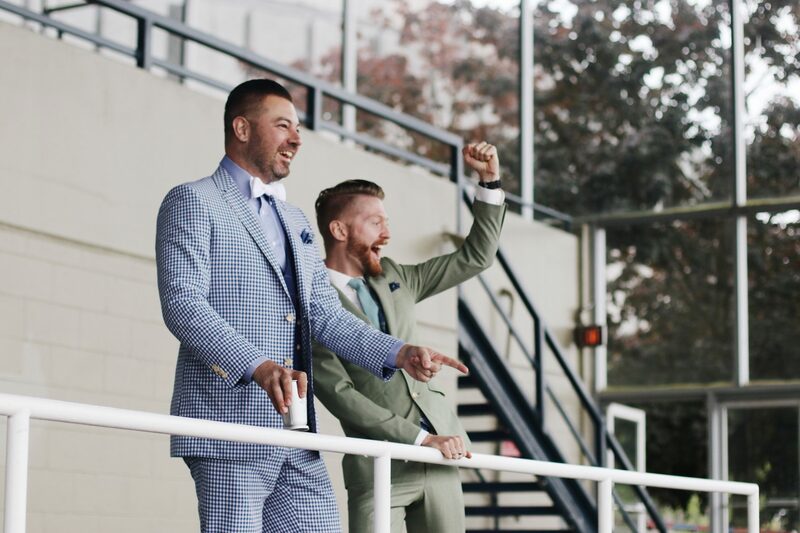 Jordan and Tyson (pictured here) and their partner Dax Droski are the masterminds behind the Deighton Cup. At the Deighton Cup, the Sport of the Kings is brought to a new level of sophistication and elegance. 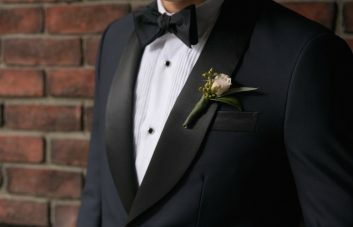 As a partner of the event, we at INDOCHINO curated an exclusive DC collection comprised of our Made to Measure suits and jackets in bold colors, luxurious fabrics and spectacular patterns. You can view the full collection here. 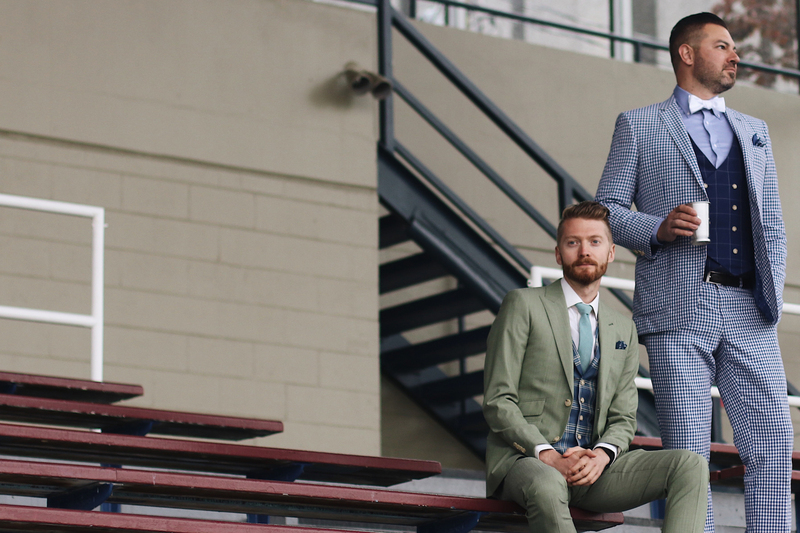 We show you how to easily put together a look that will make you a major contender at the Deighton Cup Style Stakes. 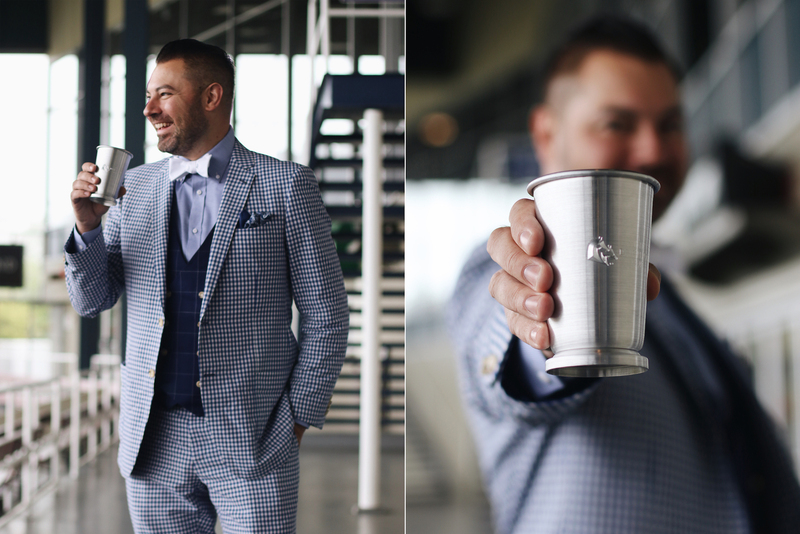 Charcoal and navy suits may be your business attire mainstays, but the Deighton Cup calls for brighter, bolder colors that make you stand out from the crowd—think vibrant tones like burgundy and sage green. If the blues and grays are your comfort zone, branch out with lighter shades like powder blue or a muted gray. 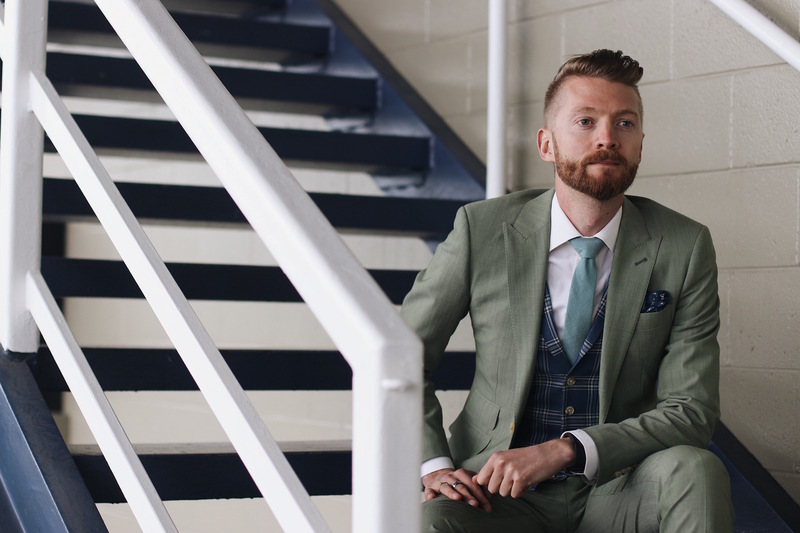 Jordan raises the style stakes in INDOCHINO’s Sage Green Wool Stretch Suit and the Blue and Ivory Plaid Vest. Patterns are not the sole territory of flannel shirts and boardshorts. Some of the most elegant suits of the summer come in sophisticated plaid, windowpane, and gingham patterns. If you’re feeling extra adventurous, mix complementary patterns together like a Royal Check suit with a Windowpane vest. As for your pocket square and tie, this is the perfect opportunity to accent your outfit with polka dots and paisley. Tyson strategically pairs the INDOCHINO Royal Check Wool Cotton Suit with an Indigo Windowpane Vest. It’s hard to keep your cool and composure when the competition is at a dead heat. 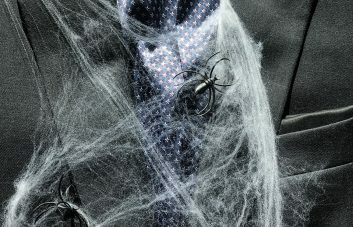 To sidestep those dreaded sweat stains, opt for lightweight suit fabrics such as linen, cotton or silk. And when it comes to wearing linen, don’t let the wrinkles scare you—its ability to soften and relax to your body only adds to its appeal. And as we previously mentioned, seersucker is often seen as the unofficial fabric of the races. A sunny day by the tracks isn’t complete without a refreshing Mint Julep. 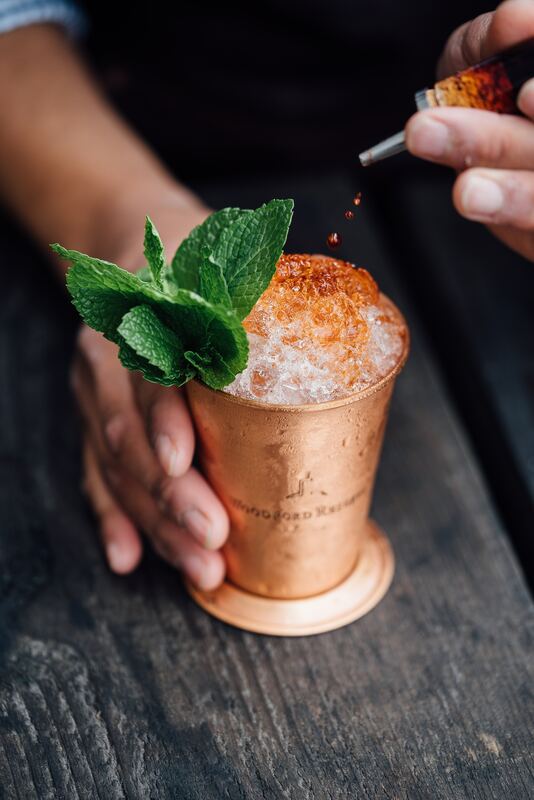 After reading countless sources for how to create the perfect Mint Julep, we’ve put together this foolproof recipe that you can whip up at home to pregame for the races. A refreshing Mint Julep hits the spot when you’re spending the day in the race pavilion. Throw 4-7 mint leaves (depending on your preference) and sugar into a chilled pewter cup. Crush the two together with a muddler. Fill your cup to the brim with crushed ice. Stir the mixture together until the cup frosts. Top it off with more ice and a couple more mint leaves. Dust with icing sugar for extra pizzazz. If you can talk the talk, that’s half the battle. Once you learn the basics of race lingo, you’re in a better position to place a winning bet. WIN – Bet that the horse comes in first. PLACE – Bet that the horse comes in first or second place. SHOW – Bet that your horse comes in either first, second or third. ACROSS THE BOARD – You guessed it. You’re betting that your horse comes in first, second and third. EXACTA – The two horses come in first and second in an exact order. QUINELLA – The two horses to come in first and second in any order. TRIFECTA – Bet that your three horses will finish in first, second, and third in an exact order. SUPERFECTA – You’re betting that four horses will finish, first, second, third, and fourth in the exact order.